It has often been said that the old part of Nice carries the most charm of the city. D’Accord, I say. From the Place Masséna, considered by some to be the central square of Nice, you are, within a few strides, in the vieille ville, the medieval quarter. Heralding this is the La Fontaine du Soleil with a very white classical figure (Heracles?) brooding over the Place, from an exuberance of fountains. In the spray there are bronze figures surrounding Hercules, each with an animal, each with a story: vide the ubiquitous Mediterranean bull brandishing horns. If you go there, start with the Cours Saleya, the open-air market, with tableware, clothes, pottery, leather goods, vegetables, fruit – and the most audible sounds of the Nicoise entrepreunerial spirit. Warm-hearted and adamant, the buxom saleslady tells you in the local patois exactly why her pan bagnat (see Afterthought) is the best on the row. I bought mine later, deeper into the narrow streets and slow moving rivers of tourists. A trio of young girls with double bass, drums and sax were most rhythmically crooning Cole Porter’s Night and Day. Towering above the tents, tables and tourists is the façade of La Misericord, 17th-century baroque cathedral. It is considered by some to be one of the most beautiful baroque edifices in the world, though its doors were locked and barred. But this vieille ville will not disappoint you if you are interested in this era of architecture – there are several masterpieces within a few minutes’ stroll from one another. These churches, cathedrals, perhaps, follow the architectural tradition – a pedimented, two-tier façade. Sainte Reparate on Place Rossetti was completed in 1650, a time when the Catholic Church was working hard on the Counter-Reformation with a building form distinct from gothic-romanesque. In the 19th-century, an imposing bell tower was added. The saint after whom the church is named is the patron saint of Nice. She was a teenage matyr in the Holy Land in the year 250 c.e. The interior, as with St Jacques, the other church I saw, has the typical baroque elements – a way of letting in light from the roof, a departure from the solemn gloom of the older cathedrals; the dome above the centre point of the church; the opulent use of colour; stucco ornamentation and the deliberate fragmenting of traditional forms like the pediment. I bought my pan bagnat at one of the cafés that honeycomb the narrow streets. I sat chewing and watching the tourists. There were large numbers of Americans, but you also hear Italian and German, and if you’re sharp, anything else there is to hear. Nice is the second most visited city in France. Above the susurration of the stream, I heard a piano accordion and saw a man in a beret playing, fulfilling one of the biding images one has of this country. Near him a gull pranced haughtily on the head of a statue of a dolphin, as a few drops of rain plonked down. I returned to Place Masséna where I saw the ongoing and extensive alterations to the area that includes the Museum of Modern Art. There was an advance on the Theatre Nationale de Nice, a massive block of a building that looked as if it had been covered with fine gossamer in its entirety, a la Christo. And then, I marvelled again, as I had done previously, at the oddest art statements in a large public place that I have yet seen – six aliminium poles, probably 25 metres tall, on which there are beige ceramic naked male figures sitting, clutching their knees, staring into the middle-distance. I have no idea who the artist is, but I assume that this is a precursor to the completion of what will be called The Art Park. There they are, naked amidst the Belle Epoque splendour of Avenue Felix Faure and the rest of Nice. Source – Wikipedia – “The Pan-bagnat (Occitan: pan banhat for wet bread) is a sandwich that is a speciality of the region of Nice, France. The sandwich is composed of a circle formed white bread around the classic Salade Niçoise, a salad composed mainly of raw vegetables, hard boiled eggs, anchovies and tuna, and olive oil (never mayonnaise). Sometimes balsamic vinegar, ground pepper, and salt will also be added. The name of the sandwich comes from the local Provençal language, Niçard, in which Pan-banhat means “wet bread”. It is often misspelled “pain bagnat” which, with French pain rather that genuine local pan, produces a hybrid term reflecting neither the pronunciation nor the spelling used in Nice. The Pan-bagnat is a popular lunchtime dish in the region around Nice where it is sold in most bakeries and in most markets. The Pan-bagnat and the Salade Niçoise (Salade Nissardo), along with Ratatouille (La Ratatouia Nissardo in Provençal), Socca and Pissaladière are strongly linked to the city of Nice, where they have been over time developed out of locally available ingredients”. Three ‘bus rides and a gruelling trek up the hill to the vieux village – I went to see this museum, worth every centime and bit of energy. It was opened in April, 2011, and has been made possible by the British entrepreneur and art collector Christian Levett. I submit that this is what bankers need to be doing with their millions instead of the other nefarious things we have heard of recently. 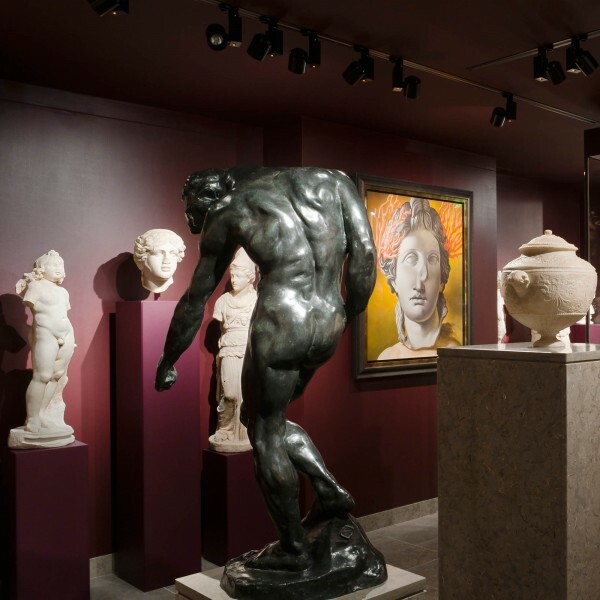 The museum aims at highlighting the classical influences on artists from Rubens in the 17th-century to the contemporary British sculptor Gormley who has cast two male figures standing at the entrance. The work is called Reflection and recalls the myth of Narcissus. By the reception desk there is an immense hollow steel cast of the head of Michelangelo’s David, but it has been sabred into sections. 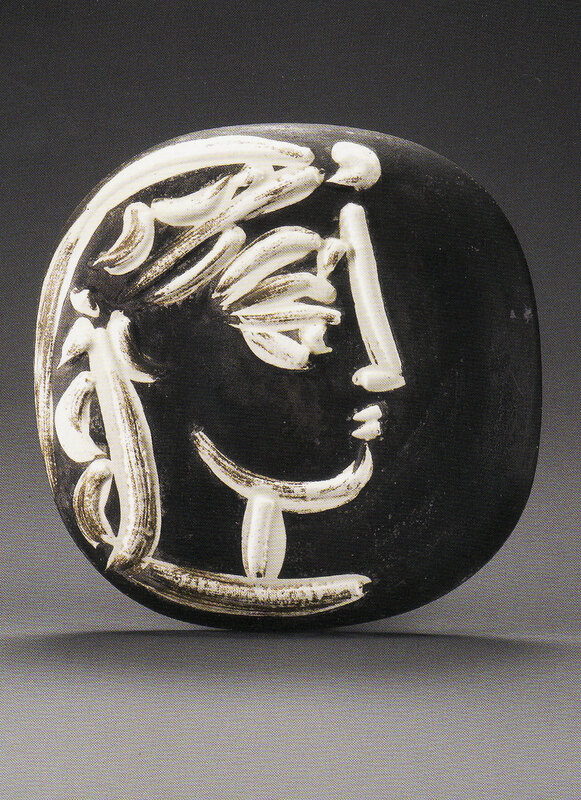 This was done by Arman in the late-90s. I heard with disappointment (again) that no photographs were allowed. The museum, a tasteful interior of glass, chrome and marble, is housed in a traditional building and is not spacious. Most of the busts are Roman and between the 1st- and 3rd-centuries c.e. They crowd together, but each is a marvel. The subtle detail achieved at that time makes one realise again, as one writer put it, that art does not improve; only its media change. Beyond this era of Greek and Roman sculpture, art has seldom achieved the same level again. Of these busts one is of Nero, done in 59 c.e. at the time he was alive – a young, flabby face. Hermes and Ariadne, st century, c.e. 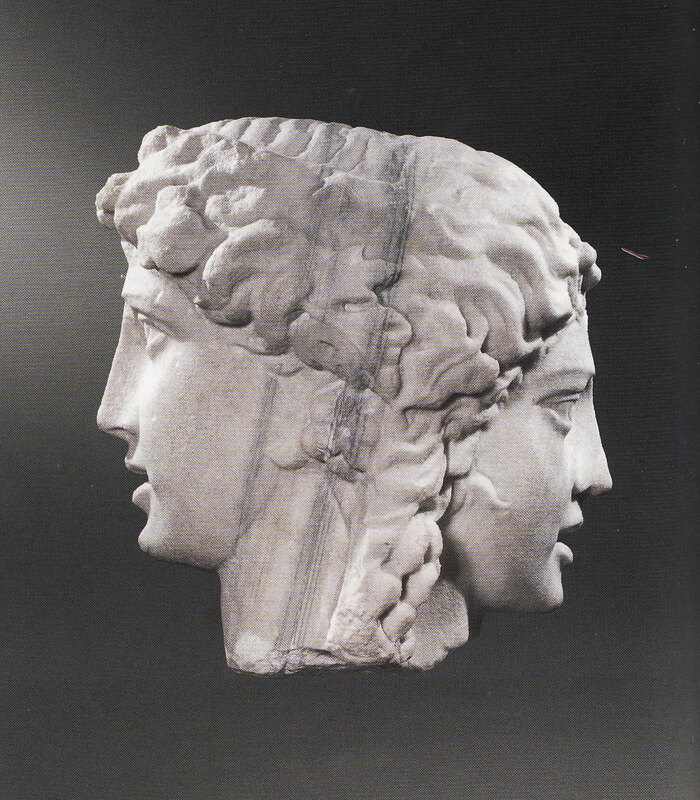 Another is a janiform bust with a severe Hermes on the one side and a gentle, expressive Ariadne on the other. 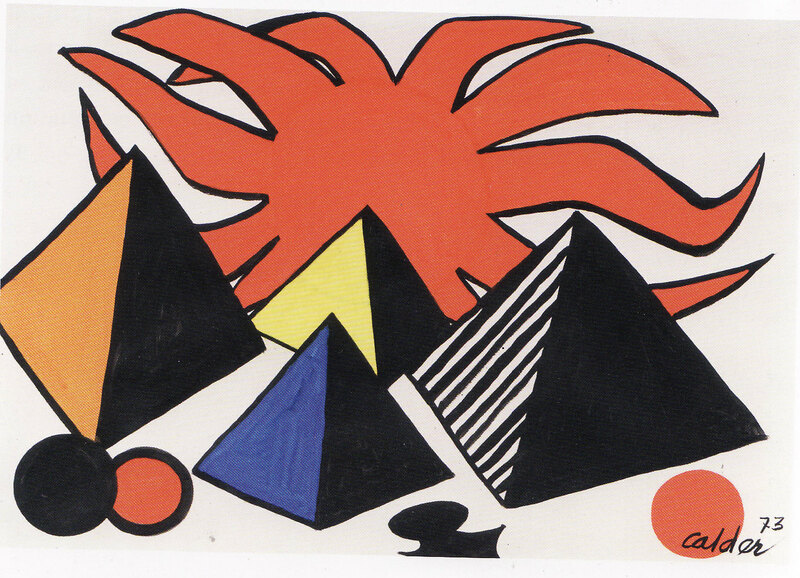 Everywhere are the works of modernist and contemporary artists, powerfully juxtaposed with the classical – Chagall, Picasso, Léger, Calder, Klein, Lichtenstein, Warhol, Dali, the list goes on. One Roman bust, a sneering, hard-faced emperor from the 2nd-century was copied by Henri Matisse when he was a student – the bust is next to the 19th-century drawing of it. Yves Klein produced a neon purple Venus de Milo which kind of screams at you. Raoul Dufy’s painting Orpheus charming the animals (1939) is playful, frieze-like. Chagall’s Bacchanalia (1964) is a series of falling and climbing figures, raucous in a way that contrasts with the solemnity of his spiritual works. Warhol’s Venus rising (1960s) is a lurid copy of Botticelli’s Venus. Carlo Maria Mariani’s Transformation (1998) in its way sums up the purpose of the museum. The work is a painting of a bust with its nose broken, something which happens more often than not to statues from antiquity. But below the broken nose emerges a nose that is real and the lower half of the face is naturalistic – a strange, surreal double image, but one that says it all: from the art of the past we have built modern and contemporary art; we are inspired by you; you are our soul, even as we struggle with our primary-coloured despair and stumbling spirits. The Egyptian floor has, as with the other floors, a simple explanation of the exhibits: this culture, it says, has exercised the most fascination for people past and present. There are two sarcophagi, more than 3000 years old, that are striking – one was for a temple chantress and is decorated extensively and beautifully with autumn-coloured hieroglyphs. The face above the folded arms is a purity of sad serenity. 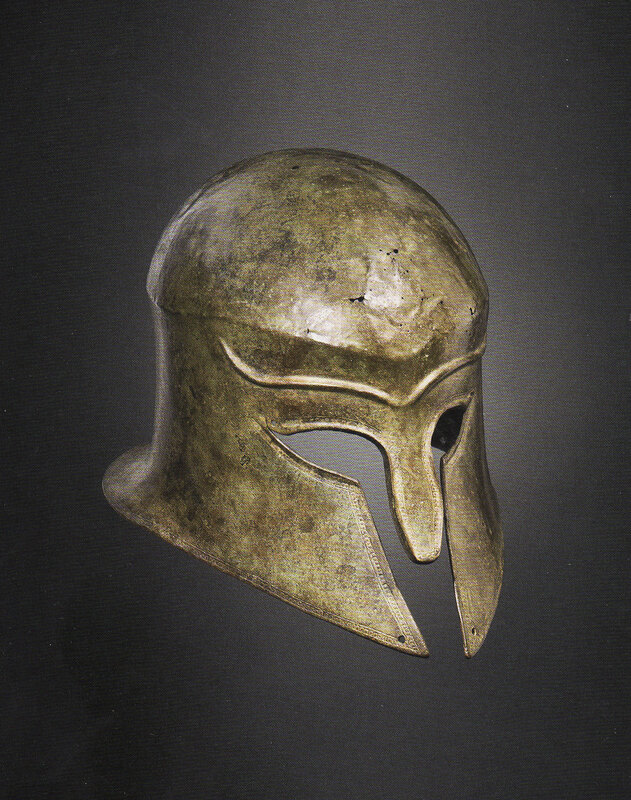 The top floor is given to Greek and Roman helmets, breastplates, spears and swords, the most extensive collection I’ve seen. And there are objects of rare beauty, lovingly wrought, for the purpose of great destruction, getting power and keeping it. I saw the words of Heraclitus (505 – 475 b.c.e) – War is the mother of everything. I don’t understand this, not in a place like this, one of great creativity. I had a less ambivalent reaction to the words of Tite-Live (27 b.c.e. – 40 c.e.) – Mourir pour son pays est, je l’admets, une chose glorieuse. Had this Roman writer, a contemporary of Christ, read Wilfred Owen’s poem which describes a man dying from a mustard gas attack in WW1, he would not so blithely have believed the Old Lie: To die for one’s country, I admit, is a glorious thing. I trekked down the hill from the vieux village in cicada heat, got lost, eventually found the ‘bus stop and disappeared in the traffic moving in the direction of Cannes. 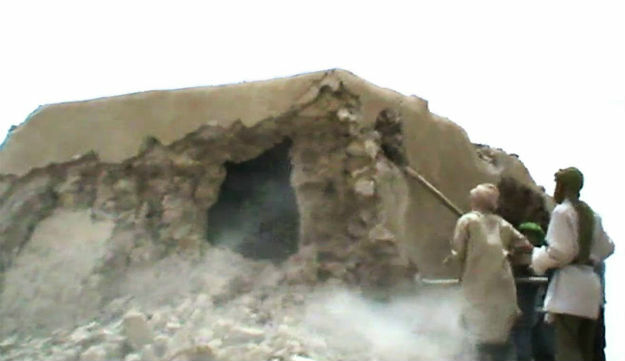 In recent BBC World television coverage, I watched devotees of Ansar Al Dine hacking away destructively at the tombs of Sufi Muslim saints in Timbuktu, Mali. 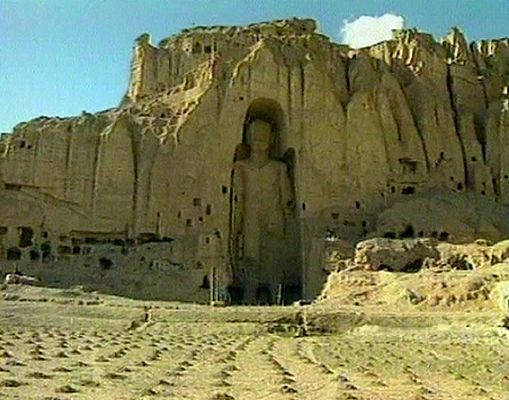 In 2001, the Taliban dynamited the historical Buddhist statues of Bamiyan fashioned in the sixth century c.e. During the “cultural revolution” in 1966, Mao’s Red Guards did incalculable damage to Buddhist temples and art. In the 17th century Protestants scrubbed art off the walls of cathedrals in Europe. Through the first millennium c.e. Christians hacked at the monuments of the pharaohs in Egypt. The history of religious and ideological intolerance in relation to heritage around the world is long and tragic. The destruction is irreversible; the loss, absolute. For South Africans in tourism the problem has been discussed and to a large extent we are dealing with it. Thus far it would seem that the spirit prevailing in 1994 – a momentous political transition without a war – also prevails in matters of heritage. How do people of colour in South Africa feel about the monuments of the past, set up by an authoritarian government during the apartheid era, an extension of a grossly unequal history? Are these statues, buildings, memorabilia and sites part of their heritage? The answer is, of course, yes. But in what way? Does a visit to Groot Constantia serve as a homage to Simon van der Stel or as a reminder of slavery? For people of colour, probably the latter. The owners of Groot Constantia have a permanent exhibition depicting aspects of the history of slaves. It would seem that there is sensitivity about these matters, both from the government and from the side of those whose predecessors were represented by these inheritances. One of most magnanimous gestures in recent times has been the subsidy for the Voortrekker Monument in Pretoria which will help to preserve it as part of Freedom Park, a development that stimulates thought and feeling to all who visit it. It is significant that township tourism has been the sector of the industry showing substantial growth. With this growth is the recognition of sites, buildings and memorabilia that are deeply meaningful to black people. The question remains: to what extent can there now be a confluence of the two histories, often in painful conflict? When I stand on Church Square in Cape Town, I see the confluence of the two streams, one turbulent. The statue of Onze Jan (Our Jan) has hitherto dominated that space, a man instrumental in the recognition of Afrikaans as a language. He now shares that space with several marble blocks bearing names of slaves imported from other parts of Africa, Indonesia and Madagascar. It is almost as if he stands amongst them, the two forming a single image. Across the street is the Slave Lodge with ongoing exhibitions and depictions of history. The Prestwich Museum points us to a dark strain of our history – the mass grave for paupers and slaves uncovered at Green Point. Cape Town and its tourist industry have in the past decade and a half become well and truly aware of a history which includes the inequities, the injustice and the cruelty. Will tolerance of the two histories prevail? Or will there come at some future point extremist hackers with their hammers? Are we developing a consciousness that can philosophically bring the two histories together and make them one? The need to do this is founded on the value of preserving monuments from the past no matter what cruelty they imply, no matter how much pain they caused. The Valle de los Caidos near Madrid in Spain is an instructive example for us. 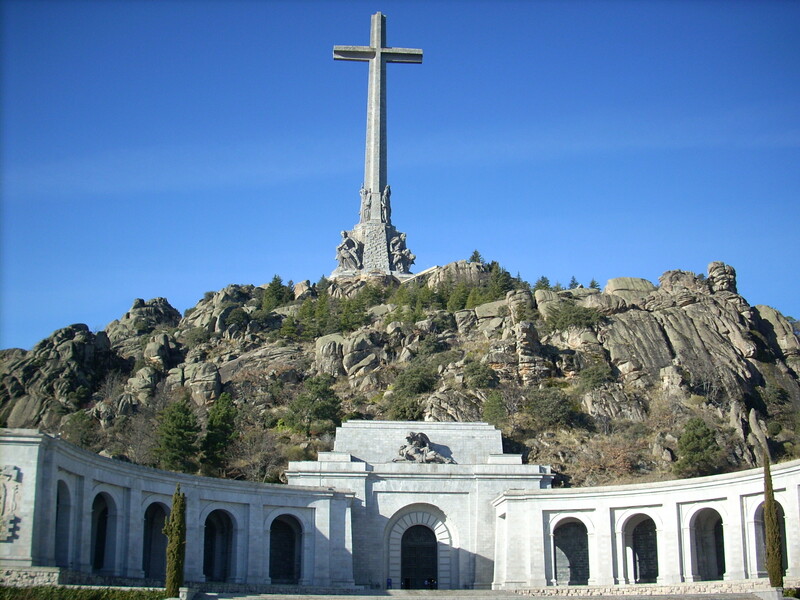 It was erected by the dictator Franco who held sway almost forty years, a monument to those who died in the bitter Civil War in the 1930s, 47,000 lives at the outset of that war. It is said that this large edifice was in part erected by convicts and that many in Spain still do not accept the place as a monument to reconciliation as it was intended by Franco. Should the Spanish break it down? No. The Spanish and we who tour there view it through an expanded consciousness. 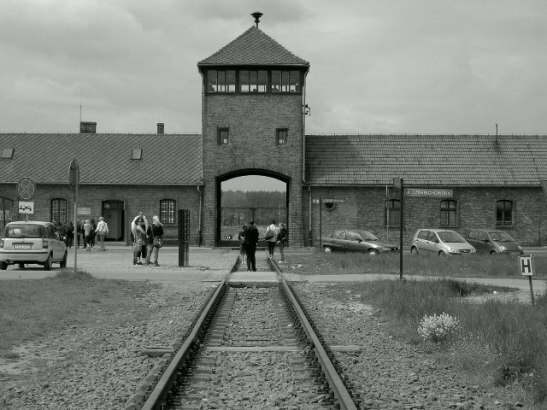 Perhaps the most horrifying of such sites is that of Auschwitz in Poland where hundreds of thousands of people were systematically murdered. It is an international monument with streams of tourists passing through it. It is easy to see why it has been preserved as a tourist site and not destroyed: we may not forget what we are capable of doing. 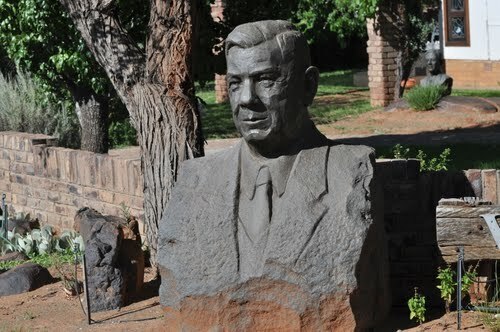 Though I am not sure of the details, I have heard that the statue of Dr Hendrik Verwoerd, often called the architect of apartheid, was removed from its public place in Bloemfontein. I would imagine that part of the reason was to guarantee its safety. In recent times there has been a call by a group of San descendants to remove the statue of Jan van Riebeeck from Adderley Street in Cape Town, seen as a symbol of white colonialism. This is open to debate, I imagine, and I would argue that colonialism, for all its negativity, also brought benefits to the colonies that these very San descendants would be loath to part from. There will be debates, but I feel confident that with the spirit that we have seen from 1994 to the present we will work it out. I conclude with the transformation of Vlakplaas. 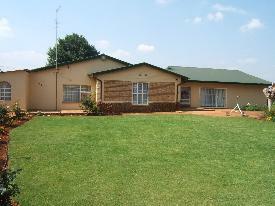 Vlakplaas, twenty kilometres west of Pretoria, was a farm housing the headquarters of the counterinsurgency unit in the apartheid era. Opponents of the regime were “re-educated” or executed. In August 2007, the South African Department of Science and Technology announced that the farm was to become a centre for healing where traditional medicines would collaborate with western forms of medicine. This site deserves to have a respected place in a tourist heritage itinerary, the more so for being on a continent racked with pain on every conceivable level. We live with it and it is sad that few of us allow this august presence to relieve us of our quiet desperation as we hurry through our streets and minds. Perhaps we do pause when the Table Cloth pours across the crag, a vast white cloud, dissolving massively before our eyes before it tumbles into the cradled city. Hoeri-Kwagga they called it, those who inhabited the Bowl more than 100,000 years ago. To the right is Lion’s Head, claimed by some to have been the site of the moon cult by the Khoi-San people. To the left, Devil’s Peak, the naming of which has an interesting history. British explorers wanted to name it after King James I, but a quirky little folk tale about a local who outsmoked the devil himself seems to be source and the name stuck. In mid-July you can go to the observatory and view Mons Mensa, a constellation below Orion, named after the mountain by the French astronomer Nicolas de Lacaille in the mid-18th century. One wonders whether it was his description of Table Mountain to an artist in France that produced the charmingly inaccurate etching, amongst others, at that time. “On the 6th April, 1652,” write Marquard and Mervis, “Jan van Riebeeck landed at the Cape to establish a halfway house for ships. On the 7th, he applied for a transfer.” So begins the funniest book about South African history yet written and it suggests that this gracious city took time to get there, as do all cities, with some of them simply limping, as far as aesthetics goes. Cape Town, of course, with Table Mountain, had an unfair advantage over every other city. If we wanted to wax poetic about this place, we won’t be the first and we’d be in elevated company. The 16th century Portuguese poet, Luis de Camoens, in the epic poem The Lusiads, tells of Adamastor, a son of the titans, who was turned to stone, the Table Rock we witness. How can you not feel epic when you stand at Blouberg Strand and see it across Table Bay, spanning the city? I stood there some time ago with a smooth pebble in my hands, its white sediments looking like a hotcross bun. I showed it to the geologist who spoke about the age of Table Mountain. He said that’s even older than the Mountain itself. Image Sources: Table Mountain – tandatulas.com, Lions Head – source unknown & 18th-century etching – in public domain. The troubadour saw that there is poetry in a fashionable resort like this one; you have to work to find it. The mid-summer crowds, the thick heat, the movement, with colours like a Picasso poster, curving and swerving, cluttered and abundant… a kind of plastic phantasm, a flurrying unreality, with profiles, suntanned midriffs, arms, sunglasses, slingbags, beach umbrellas and the chatter of nations… three hundred restaurants are clinking, forty hotels fawning and the traffic nudges forward, nudges forward, clearing its throat. Is there a merciful breeze drawing over the iced aperitif? Further from the bundled streets, quieter, almost disdainful, is the deep green of Le Cap d’Antibes where solemn estates lie cool by the sealine. Here is Le Grand Hôtel du Cap where Scott Fitzgerald and his wife Zelda, in the mid-1920s, sipped whisky and played cards under striped umbrellas on the summer morning beach. A gaggle of celebrities passed through their hazy days – Rudolph Valentino, the heartthrob of the silent movies; the novelist John Dos Passos; the revue artist Mistinguett; the director Rex Ingram…the list giggles on, as the money and the glamour begin to fray precariously and the jazz age winks drunkenly over a footless goblet. The poetry is there. Europe comes to find it, Americans too, the ones who set Juan-Les-Pins on its feet, Russians and others from countries where summer was on a Thursday last year. So, Marie-Claire, lost under the high umbrella of sun, in the surging waves of people and blue, what will we find when we look inside your pretty head? Image Sources: Cannes Doves, poster by Picasso 1958 & Juan-les-Pins poster 1930s. Simone, Claudie’s friend, drove us through the Valmasque forest – mainly pines, olive trees, cypresses – up to the vieux village of Mougins. As with many towns in Provence, it is a fortified village, village perché, on a hill top, most necessary in this case since it is within sight of Cannes where the Saracens held sway for eighty years in the Middle Ages before they were defeated by the locals. In fact, one of the original archways is called Porte Sarrazino which gives you a view all the way to the coast. But prior to the Middle Ages, prior to the Romans and the Greeks, there were the Ligurians, the ancient tribes. 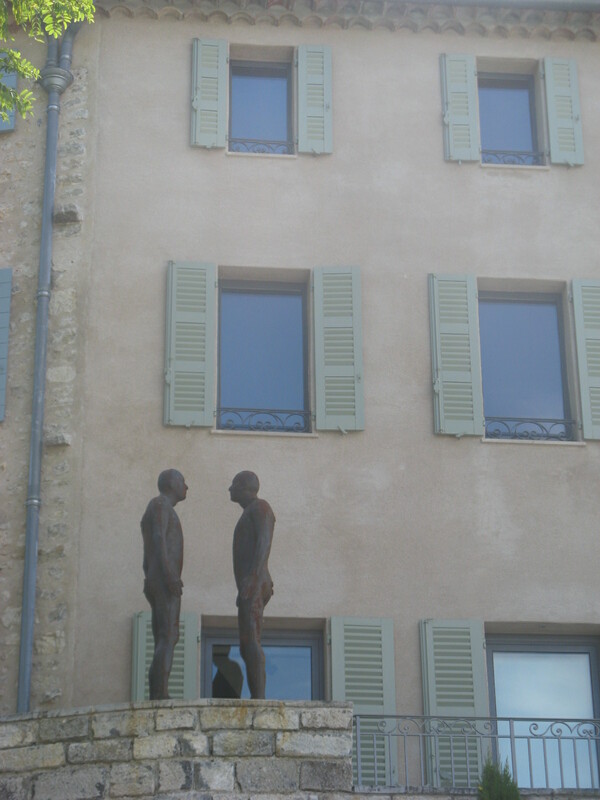 The guide books are quick to inform you of the long list of artists and celebrities that have visited Mougins, notably Picasso who spent his last 13 years here. It’s the view, I imagine. When you arrive you see a 360-degree view of the Côte d’Azur and I’m told that in winter the surround of the snowline on the Alpes Maritime is spectacular. I was hoping to visit the Museum of Classical Art there, but for some reason looked past it and have been to see it on a subsequent visit. What I did see, quite by chance (one of the nicest things about travel is the chance find), was the Museum of Photography. The prime mover in setting up the place is André Villiers, one of the great photographers in France and a personal friend of Picasso, making possible a remarkable collection of images of the artist, which is on display. His own art photographs, together with a number by Jeanloup Sieff, are also there. I was forbidden to take photos of the photos, which made me grind my traveller’s teeth, because some of them were remarkable. On the way back we peeped into St Jacques-le-Majeur, an 11th-century chapel that was refurbished in the 1990s by Americans. Can we – Americans and ourselves – deny the attraction we feel for the depth of European history? The smooth interior of this chapel has been tastefully done in autumn pastels and renders a peace. I was struck by the stained-glass window, contemporary, and in primary colours: a man in a blindfold, perhaps signifying a martyrdom. I had gone off on my own and on returning found Claudie and Simone sipping juices at one of the many restaurants. Approaching them, I asked, “What are two lovely girls like you doing in a lovely place like this?” Quite near to us, a capricious piece of art that I called The Dancer graced the terrace above the summer valley, humming with cicadas. It must be one of the most well placed galleries in Europe. It perches like a bird at the edge of a high hill that overlooks the valley of cypress trees rising to St-Paul-de-Vence. The Maeght family and others, among them André Malraux (who had worked for the museums of Chagall and Léger), approached the Catalan architect J.L. Sert in the early 1960s and made invitation to major artists – Chagall, Braque, Miró, Giacometti – to do an outpouring on that height. I was there in 1972, eight years after the Fondation had been opened. I have been there again. I walked from the main road through summer heat up the hill past a herd of tourist buses, through the cool forest. A stone wall loomed and beyond that the soft green lawns of the museum. On the lawns (“Keep off the grass” it says tartly in English) are sizeable works by Calder, Jean Arp, Barbara Hepworth, to mention some. Then, among the pines, is the chapel designed by Georges Braque. In this intimate, starkly modern space, there are seats for fourteen people. The crucifix is slender and vulnerable below the blaze of blue and yellow stained glass windows with a dove motif. I remember the Giacometti courtyard where his most distinctive figures stand thinly to attention or stride thinly. Above this courtyard are the unusual white U-forms of the roof, inverted domes, that are iconic for the Fondation. One bears in mind that a Catalan designed this place, coming from the culture of Joan Miró, Salvador Dali, Picasso and Gaudi are all Catalans, all startling. Further, as you walk along the terrace with its spectacular view, now more overgrown than when I was last there, lurk the quirky pieces made by Miró, like hobgoblins, stringy wood spirits and the gargantuan half-elephant. They call this his labyrinth. In a clearing, against the haze of the valley below, is the well-known Pitchfork-balancing-on-a-Wedge that I remember. Inside, the spacious halls house large paintings by Léger, Chagall and others, works of colourful complexity. I did not particularly care for the extensive retrospective of Gasiorowski, mainly works from the 1970s – somehow more “easily” flung on canvases than the early modernists, and rather forgettable, I feel. Perhaps I was tired, perhaps the thick heat of Provence was getting to me. I stood watching water play on a mosaic of cubist fish designed by Georges Braque. Down the hill through the cool forest to the road where I would take the ‘bus to Nice… At the crossroads is a giant sculpture, steel planes swirling in an abstract dynamic against the sky. Is it guarding the art of Provence?